Before and after the removal of invasive non-native plants including Russian olive and tamarisk. Courtesy of Kansas Partners for Fish and Wildlife. Over the last couple of years, the USFWS Kansas Partners for Fish & Wildlife Program along with numerous partners have been successfully leveraging funding sources — including a NAWCA small grant and a Kansas Forest Service grant — to support the removal of invasive tamarisk and Russian olive trees in the Rattlesnake Creek Basin, which is upstream of Quivira National Wildlife Refuge (NWR). 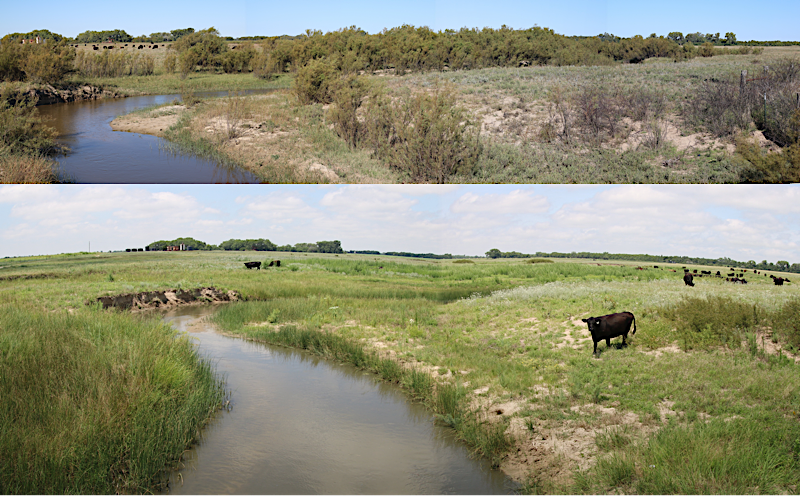 Working with Kansas Grazing Lands Coalition and Kansas Alliance for Wetlands and Streams, the Partners for Fish & Wildlife Program has restored over 600 wetland acres and 1,900 acres of associated native prairie through voluntary private landowner projects. When Russian olive and tamarisk are removed, stream health is improved, which improves forage for cattle and provides expanses of herbaceous marshes that are very attractive to migrating waterfowl and other wetland dependent birds. Water flowing downstream to feed Quivira NWR wetlands is also enhanced, and waterfowl hunting and wildlife viewing opportunities are increased. 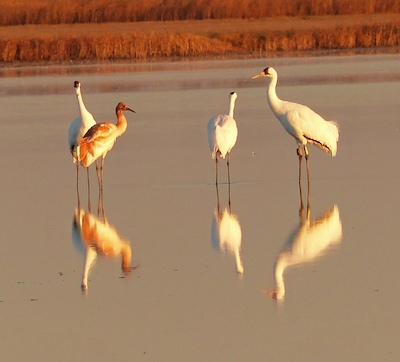 Whooping Cranes on Quivira NWR. Courtesy of Barry Jones, USFWS. Quivira is located in a narrow section of the Central Flyway where many migratory waterbirds are funnelled on their journey north. Its unique inland marshes and alkali flats make this region an area of greatest continental significance to North American waterfowl and shorebirds and also provides critical habitat for rare species, such as the federally endangered Whooping Crane. Russian olive and tamarisk can rapidly invade wildlife areas and cause habitat loss through dense growth that displaces native plants, increases soil salinity, uses high amounts of water, and alters stream flow. The project partners — which include Kansas Department of Wildlife Parks and Tourism, Kansas Prescribed Fire Council, The Nature Conservancy, and many others — continue to leverage existing resources to fund additional work. The second phase of the project has been included in a Kansas Prairie Wetlands Standard NAWCA proposal submitted last July. Photo caption: Before and after the removal of invasive non-native plants including Russian olive and tamarisk. Photos courtesy of Kansas Partners for Fish and Wildlife.